There are two things that the Democrats have proven they can’t do. Run a website (Healthcare.gov fiasco). Take care of veterans (VA scandal). Those two shortcomings recently blended together in an embarrassing display of incompetence on the DNC’s website. 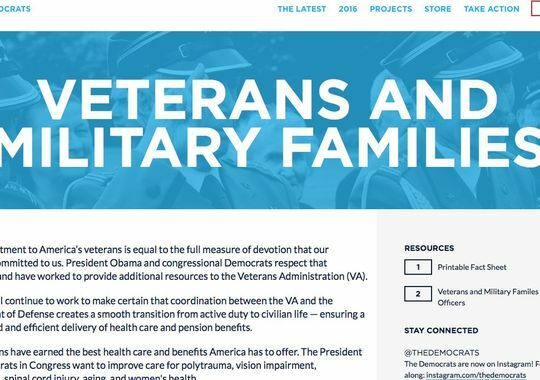 Veterans were proudly displayed on the “Veterans and Military Families” section of the DNC site in a photo, which showed President Barack Obama greeting vets in Warsaw back in 2011, Military Times reports. That commitment seems odd in light of the fact that the DNC can’t differentiate between American and European servicemembers. The DNC took the photo down and issued an apology yesterday after The Military Times pointed out their error. You can see from the photo that the troops in the picture are clearly not wearing American style uniforms and it doesn’t take a three-star general to recognize the difference.